Tina Freeman was elected Caldwell Co. District Clerk in November 2006 and took office January 1, 2007. She worked in the District Attorney’s Office in Caldwell County for 10 years prior to being elected. 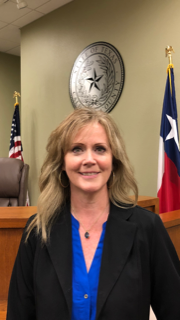 She is a member of the Texas District Court Alliance and the Texas County and District Clerk’s Association, where she has served on the Education Committee. Section 9, Article 5 of the Texas Constitution: "CLERK OF DISTRICT COURT. There shall be a Clerk for the District Court of each county, who shall be elected by the qualified voters and who shall hold his office for four years, subject to removal by information, or by indictment of a grand jury, and conviction of a petit jury. In case of vacancy, the Judge of the District Court shall have the power to appoint a Clerk, who shall hold until the office can be filled by election.” The District Clerk supports the District Courts and is registrar, recorder and custodian of all court pleadings, instruments and papers that are part of any cause of action in any civil or criminal district court. The courts supported by the District Clerk in Caldwell County include the 421st, 22nd, and 207th District Courts, Caldwell Co. Court at Law Judge for Juvenile cases, and 2 Associate Judges for CPS Cases and Child Support Attorney General Cases. If you need information about birth certificates, marriage licenses, property records, or misdemeanor criminal records, you will need to contact the COUNTY Clerk's Office. IMPORTANT. Please read notes below before entering the payment site. Jurors are selected electronically at random from a list compiled by the Secretary of State's Office, utilizing a list of voter registrations and a list of driver's license registrations from this County. Please read your summons carefully. The exemptions and disqualifications for petit jury service are stated on the summons (see example below). If any disqualification applies to you, you cannot serve. You must circle the disqualification and return the card to the District Clerk. If any exemption applies to you, you do not have to claim it and you may serve. If you claim an exemption or disqualification, please do so immediately upon receipt of your summons. Please circle the appropriate number, then sign and date the summons and return it to the District Clerk. For all individuals not claiming a disqualification or exemption, please appear on time, and BRING YOUR SUMMONS with you when you report (with the questionnaire portion completed.) IT IS IMPORTANT that you call the JURY INFORMATION NUMBER printed on the front of your summons the weekend/day prior to your summons date for updates. Please note that our office does not provide updates for a jury panel summoned by County Court at Law. To reach one of the staff members below, call the main office number, PRESS #, then the extension number. beginning July 1, 2019, attorneys MUST electronically file criminal documents in Caldwell County. (See Court of Criminal Appeals Order No. 16-003). Please read through the rules below, paying close attention to Part 5 regarding the filing of documents that contain sensitive data, if the data is not specifically required by statute or court rule. See E-Filing Business Processes for more information (and additional forms in form section). If you are appearing in court for a hearing within 24 hours of filing thru e-File, you will need to provide a courtesy copy of the filing to the Court. The staff in the office cannot give you legal advice. The following resources may provide various forms and can help guide you if you choose to proceed without an attorney. We encourage you to utilize the links and forms below to better serve you and your business with the District Clerk’s Office.